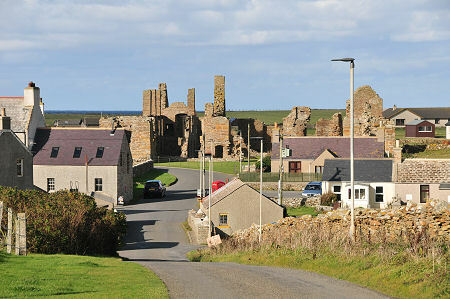 The village of Birsay in the north west corner of Orkney's West Mainland is dominated by the extensive remains of the Earl's Palace. The scale of the ruin seems odd in this largely rural coastal setting, and your first reaction on seeing it is to wonder why it is here at all. The answer lies with Robert Stewart, the illegitimate son of King James V of Scotland and one of his mistresses, Euphemia Elphinstone. Robert was born in 1533, and in 1564 he was given the Earldom of Orkney and Lordship of Shetland and the position of the Sheriff of Orkney. 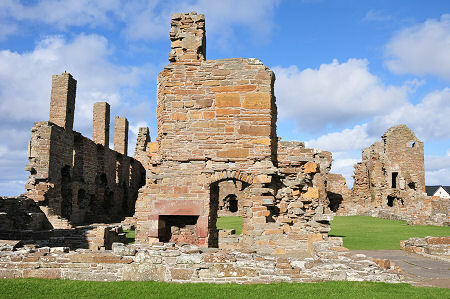 In 1568 he added the properties formerly controlled by the Bishop of Orkney to his estate, including the Bishop's Palace in Kirkwall and extensive lands around Birsay. Robert's rule was so harsh that he was imprisoned in Edinburgh in 1575, but by 1581 he was back with added titles and even more absolute power over Orkney and Shetland. Robert died peacefully in his bed in the Bishop's Palace in Kirkwall in 1593, but his passing was not mourned. By the time of his death, Robert's son Patrick was already abusing the titles of Earl of Orkney and Lord of Shetland. It was Patrick who in 1607 built the Earl's Palace in Kirkwall, following the family tradition by using forced labour to do so. Patrick's demise started with his summons to appear before James VI in Edinburgh in 1609 to answer for his various misdeeds, and from 1610 he was imprisoned in Dumbarton Castle. Patrick was still trying to negotiate his way out of prison when, in May 1614, his son, another Robert Stewart, led a rebellion against the Crown. He started by landing at Birsay and taking control of the Earl's Palace, before mustering enough support to defeat the acting Sheriff and 200 armed men who came to arrest him. 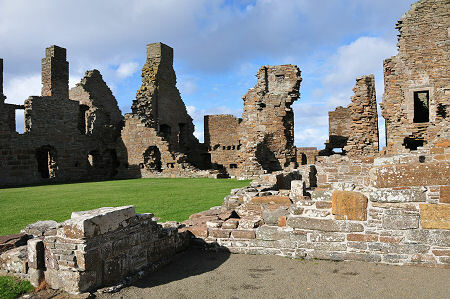 Robert then marched to Kirkwall, taking control of Kirkwall Castle and the Earl's Palace there. James VI responded by sending forces under the Earl of Caithness to Orkney on 23 August 1614, and following an artillery bombardment that destroyed the castle, Robert surrendered. He was hanged in Edinburgh on 1 January 1615, and his father Patrick was beheaded on 6 February. It is said that part of the delay in Patrick's execution was due to the need to give him time to learn the Lord's Prayer. It is because of the Stewart family that visitors to Orkney have ever since been confused by the presence of not one but two Earl's Palaces, in very different parts of Mainland. 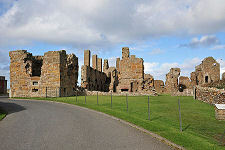 The Earl's Palace at Birsay continued to be used by the Stewarts' successors to the Earldom, the Earls of Morton. But by 1650 it was recorded by Cromwell's forces when they requisitioned the building that windows were broken and shutters missing: and by 1700 the roof had collapsed. A tour of the Palace shows that in its brief heyday this would have comprised a grand group of buildings set around a courtyard. The ranges rose to two storeys, and the corner towers to three. A north range was added in the 1580s complete with a Great Hall at first floor level. Today's Earl's Palace at Birsay is so extensively ruined that it is difficult to get a strong feel for what life was like here. But for an insight into a difficult period of Orkney's history, a visit is highly recommended, particularly for those completing the picture partly formed at the Bishop's and Earl's Palaces in Kirkwall. The Palace is open all year and admission is free.